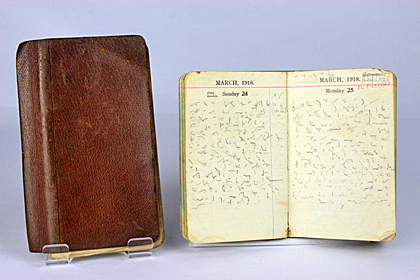 Two diaries, written in shorthand almost a century ago and donated by a local Old Comrades Association, have led researchers at York Castle Museum to make a public appeal for translators to help in understanding them. Corporal William Reader, of C Squadron, 1st East Riding Yeomanry, is thought to have filled the books with notes and thoughts during the Palestine Campaign. Unfortunately, though, his writings have proved impossible to decipher. The soldier wrote his diaries during 1917 and 1918, but the museum says it has found ‘very little’ accompanying information about them. ‘This is such a fascinating project,’ said Alison Bodley, curator of history at the museum. ‘We have in our possession two diaries from nearly 100 years ago, but we can’t understand what has been written in them. The journals will go on display as part of the museum’s exhibition 1914: When the World Changed Forever, which will open on June 28. This entry was posted in Events and tagged 1914: When the World Changed Forever, Centenary of World War I, East Riding Yeomanry, June 28 1914, Wass Reader, York Castle Museum. Bookmark the permalink.